I’ve just gotten back from a screening of Stardust and to summarize it in one word: brilliant. I read the book (by Neil Gaiman) a couple of months ago and to be honest I wasn’t that impressed. The movie, however, took all the elements that did work in the book, altered the story line into something more fit for screen and added some fantastic features. I think this might actually be the first time I like the movie much more than the book. In terms of style, it certainly belongs up there with Labyrinth, The Princess Bride and The Never-Ending Story, but what I love from this movie is that it isn’t a kids movie. Yes, kids will enjoy it, but it’s not purely aimed at them. It’s first and foremost a fairy tale, albeit a very funny one. The movie is set 150 years ago in the small English town Wall, named after the nearby wall guarding the way to the magical kingdom of Stormhold. 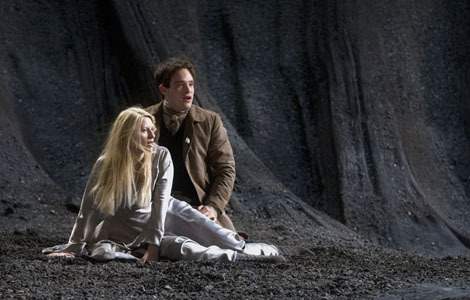 Our protagonist is Tristan Thorpe (Charlie Cox), a young man from Wall, with an unrequited love for the pretty but cold Victoria (Sienna Miller). While seeing a shooting star fall down to earth, Tristan promises to go beyond the wall and retrieve it to prove his love to her. He finds the star, only to discover it is a beautiful, shining girl named Yvaine (Claire Danes), knocked out of the sky by a jewel. This jewel is the dying king’s solution to the succession to the throne of Stormhold; whichever of his sons reclaims the jewel and survives the assassination attempts of the others, inherits the throne. From the seven sons (all aptly named Primus, Secundus and so on to Septimus) only three still are alive; the rest, having been assassinated by their brothers, are overlooking the whole debacle as ghosts stuck in the form they died in (axe in the head, etc). Next to that there’s also a witch Lamia (Michelle Pfeiffer) and her two sisters looking for the star to regain their youth, beauty and power by eating the star’s heart. While Tristan initially only wants to take Yvaine back to Wall to show to Victoria, he quickly takes on the role as her protector, slowly falling in love with her. Kudos to the casting crew; all the characters where perfectly cast. 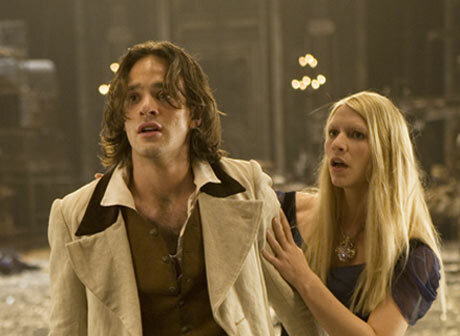 Charlie Cox was fantastic as the unworldly shop boy trying to find his place in the world. You could really see his transformation into a man unfold on the screen; although it was helped by the makeover and haircut halfway through the movie. I loved how they made Claire Danes literally glow of delight, matching her radiant personality. I was a bit annoyed that in the trailers and promotions it seems as if Ricky Gervais and Rupert Everett both have substantial parts, while they both only appear briefly. The most impressive performances though would have to be Michelle Pfeiffer and Robert de Niro. Pfeiffer is just perfect as the evil witch, slowly decaying from beautiful woman into ugly hag. And Robert de Niro? Superb as the ferocious Captain Shakespeare. This is just a performance you have to have seen to believe it. I won’t give anything away, but it’s unlike any de Niro you’ve seen before. I love it when the special effects don’t get in the way of the storytelling or when effects are added purely “because they are cool”. Here all effects were used to drive the plot, exactly fitting into the flow of the movie. In most fantasy films (yes, even Lord of The Rings) most effects look cheesy and you perceive them as cheesy. With Stardust there were also cheesy effects, but it somehow fit against the backdrop of the tale. There’s a great scene where Lamia turns a chariot into a giant inn with stables and everything, which just looks amazing. No fairy tale is complete without a sword fight, and boy, does Stardust deliver. It has one of the most original sword fights I’ve seen in ages (The Pirates of The Caribbean Moonlight Dance remains the best), although it could have been a bit longer for my tastes. There are also some great magic battles, with the magic visualized as green flames/light. I’m still waiting for a movie where there’s no need to picture “magic” with pretty colours. This film wouldn’t have worked if it wasn’t for the great comedy moments. My favourite bits included anything with Captain Shakespeare, but as I said before you’ll have to see that for yourself. The ghosts of the princes were also hilarious, giving great commentary during serious moments. The movie is full of little jokes, keeping the mood always light and simple. For instance, there’s a funny scene where the guard of the wall goes completely ninja on Tristan, doing spinning kicks and the like. That actor is 78! Another scene includes a mouse and they managed to get the cutest, sweetest mouse to pose all cute and sweet. I think it was a real mouse; if that was CGI I’m really impressed! I loved this movie and it certainly has made its way into my favourite movies list. Although at first glance it may seem all fairy tale like and childish, it has some great action scenes and a lot of funny moments. A must see!